Replace your old manual time clock and opt for the biometric / fingerprint TAS-D200 time attendance system. Save up to 2,000 fingerprints for your employees to punch in and out. 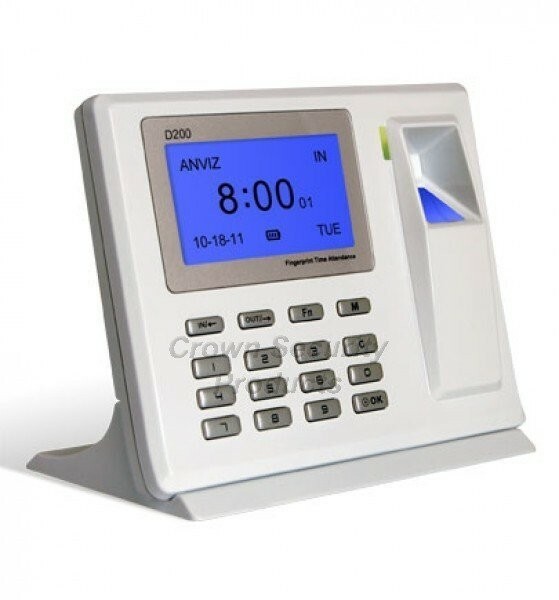 This biometric time clock has a unique desktop design, perfect for use in smaller businesses, restaurants, retail stores and businesses looking for a basic fingerprint time clock, not requiring advanced features. Unique desktop design for offices. USB Plug & Play connection. No driver needed. Fast fingerprint scan in less than 0.5 second. Eliminates paper cards and associated errors. Replace the punch paper cards your employees are using with a more advanced time attendance system. The TAS-D200 works with the fingerprints of your employees so you know exactly who was at work and when they clocked in and out. This unit features a fingerprint capacity of 2,000 and a log capacity of 50,000 records, so it will fit most company sizes. No more "buddy punching" or inaccuracy in your payroll.The high quality optical sensor will recognize any fingerprint saved in the system. The TAS-D200 features a 500DPI resolution screen and is designed for 24 hours continuous operation. Best of all, the Plug&Play feature makes it so easy to use. This biometric time clock is perfect for a company looking to take advantage of fingerprint capabilities, but does not need all of the advanced features of our higher grade models.The system comes complete with all software, cables, instructions, and is ready to use. Take advantage of our outstanding value and streamline your payroll management with this industry leading time attendance system! * Extended technical support requires the purchase of an optional support plan. Size: 6.3"W x 5.1"H x 3.5"D.
The Professional Edition of our software adds some important features to facilitate your work such as the ability to export your hours and payment information into third party payroll providers (Quickbooks, ADP, PAYCHEX, Heartland and GMS), the possibility to automatically schedule data collection from the time clocks, the capability to set multiple software users with various levels of permissions, and more!